The Broke and the Bookish : Top Ten Tuesday - Romances You Think Would Last Outside The Book! 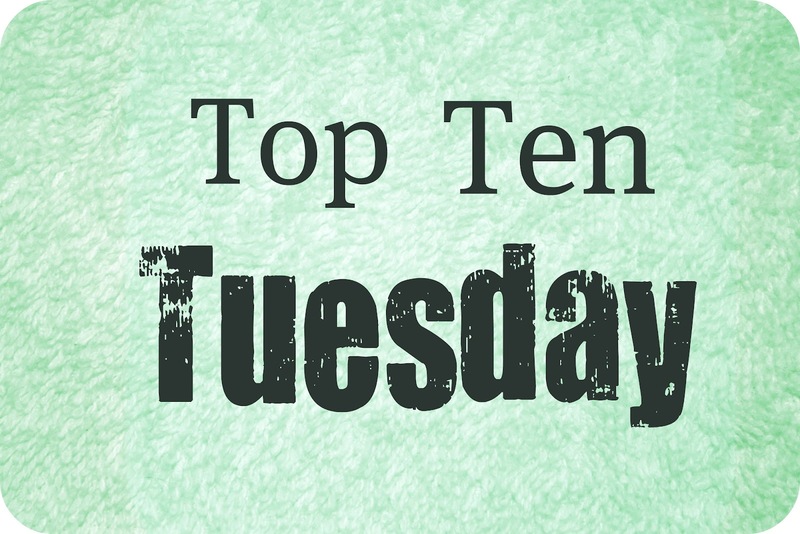 Top Ten Tuesday - Romances You Think Would Last Outside The Book! We're Talking Romances You Think Would Last Outside The Book! 1. Julia says: Mr Darcy and Elizabeth from Pride and Predjudice. I think this one is no brainer, and kind of a cop out for me :). Darcy and Elizabeth overcame a lot to get where they ended up, and that makes their relationship stronger for it. They already know how they would deal with the bad times. Besides, it took them forever to get together. They should have some happiness. 2. Tahleen says: Cleo Quinn and Johnny LaVenture in Take a Chance on Me. After my husband listed a bunch of couples that die before the end of the book, claiming that their relationships carried on in the afterlife, and then named two characters that aren't even in the same play, I came up with this one instead. Cleo and Johnny go through a lot before they finally see that they belong together, and because their relationship is so believable I have to believe they will stick together. You can read Daisy's review of this book here. 3. Jen says: Anna and St. Clair from Anna and the French Kiss. Okay, this could just be wishful thinking on my part. BUT I really think that these two could make it work in the real world. Anna and St. Clair compliment each other well and even in the book they just seemed real. 4. Kelly says: Harry and Ginny from the Harry Potter series. Is there a more perfect example of true love? Westley becomes the Dread Pirate Roberts for her. He comes back from the brink of death for her. This is fairy tale love of your life stuff- but I do think it could work in the real world. It wasn't just a "hey I've known you for 3 days let's get married" deal. Instead- before they got separated from each other, they knew each other for years and had a real love that developed. That would last outside of fairytale land. In the book, Travis and Nora are utterly perfect for one another. They each draw each other out of their respective shells in different ways: Nora finally learns the world is not the dark, scary place she was brought up to believe it was, and Travis learns to love again without fear of the "Cornell Curse" he believes to follow him around (he has ended up alone for several years due to untimely deaths of friends and loved ones). Modern-ish fairytale stuff, for sure, but under less extreme circumstances than are presented in the book, I think this relationship would have a future in the real world. Read my review here, and then go read the book because it's awesome. And I (Jamie) would totally have a few picks up but I'M GETTING MARRIED ON FRIDAY! I totally even forgot that today was Tuesday with all the crazy rushing around I was doing sooo sorry that this went up late! Nice choices :) I picked Ron and Hermione, but I agree that Harry and Ginny would propably make it too! Jamie: I hope you have an amazing wedding! And good luck with the last things! Anna and St. Clair, yessss!!!! And let's have a moment where I DIDN'T KNOW THE PRINCESS BRIDE WAS A BOOK? What? I need to go find this. Everytime I read people's lists it makes me want to be better read and to know sort of first hand exactly why people say the ones they said. I've also got a Jane Austen and a Harry Potter couple on my list, although different ones. And I AGONIZED over Westley and Buttercup, but ultimately, they didn't make my list. Love yours! Have a fabulous wedding, Jamie! Tara, it's kind of different from the movie, just to warn you, but still good. This one was hard for me to think of an example for! I'm interested to see what everyone else came up with. Of course, how could I forget about Anna and St. Clair? Or Lola and Cricket, for that matter. I just figured I should stay away from couples that we actually DID see after their own story ended! Congratulations Jamie! All the best for the day and the future. I've got Two HP couples and two Austen couples in my TTT. I love this Tuesday's theme! Been a follower of this theme for a while now, but had yet to participate. Westley and Buttercup!! I didn't even think of them but I love that choice. They have such an interesting and convoluted romance! I had Darcy and Elizabeth and Ginny and Harru too! Ahhhh - Westley and Buttercup - of course! It's true love after all! I sooooooooo need to read Anna and the French Kiss! And, Jamie - HAPPY WEDDING on Friday! Congratulations! I too had Darcy and Elizabeth (but almost didn't include them!) and Harry and Ginny. Westley and Buttercup! I really should read The Princess Bride. But I really, really need to read Anna And The French Kiss now. Oh geez! Harry & Ginny? Buttercup & Westley? How did I miss these!?! Great choices! How did I forget Wesley and Buttercup?! CURSES! I keep seeing Anna and the French Kiss - I'm going to have to read that one! I know that Sarah and Jack Elliott from These Is My Words would last forever! Awesome list! I had Harry & Ginny on my list as well! Ron and Hermione is probably my main choice. Great theme this week! I'm so glad I joined this :) I'm so sappy, I love romance. And congrats!!! Elizabeth and Darcy were my top choice. Yay, Jamie! I'm so excited for you! Congratulations! I also had Ron and Hermione and Elizabeth and Mr. Darcy. I had Ron and Hermione instead of Harry and Ginny. Interesting topic this week. This is the first time I've done a Top 10 Tuesday. It was fun! Brain wracking, but fun. It's easy thinking of couples from recent books, but I was also trying to think of older books I've read. I know I must have missed some others. I did cheat and go over 10, but it's all in the name of love. Congrats and best wishes on your upcoming wedding! I had Anna and St. Clair and Elizabeth and Darcy too! loved the topic, but could only come up with 8 couples. I didn't have Mr. Darcy and Lizzie on my list because I just figured that their love story was a given. Congrats on your wedding! I hadn't heard of The Watchers, but I'm intrigued. Congratulations Jamie! Thanks for creating this! This is my first Top Ten Tuesday and I'm happy to be a participant! This was a fun one, tough too seeing as I mostly read dystopian novels.